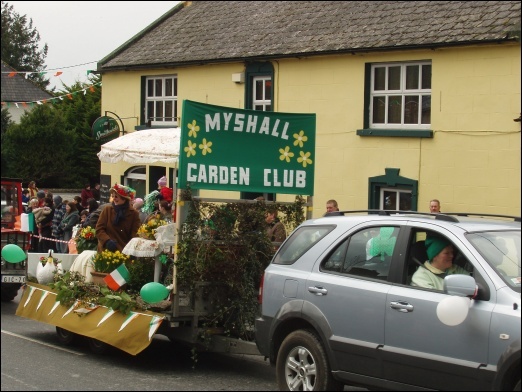 The seeds for what is now well known through the county as "Myshall Garden Club" were sown in July 2001 when Myshall Muintir na Tíre called an open meeting for the establishment of such a club in Myshall Community Centre. Since that initial meeting the Club has grown to be one of the biggest and most active organisations in the area, with membership from Bagenalstown to Bunclody. As a club we are thrilled to state that our aims to encourage gardening as an interest, to provide social outings (garden visits locally and nationally, not to mention our monthly meetings that end with a chat and a cuppa as well as a raffle) and to draw youngsters into the world of nature have all been met with gusto! Our winter flower arranging classes are a fabulous success every year with both young and old, while our 'Plant a Flower Day' with fifth and sixth classes from the local primary school have proved an invaluable learning experience both for the children, who are delighted with their piece of the community flower bed, and ourselves as tutors. In fact, our contribution to Tidy Towns (and Church or Public functions e.g. Easter and Christmas ceremonies, Local Cancer Charity, School Jubilee Celebration) has been beneficial in more ways than one, the pride and respect for our beautiful environment garnered from planting and flower arranging supersedes the pleasure of the competition participation. From the beginning our members and invited guests lecture series have been very well received and one of our proudest achievements was hosting a 'Plant and Craft Sale' in Myshall Community Centre which gave our members a platform to exhibit their talent and their ware. 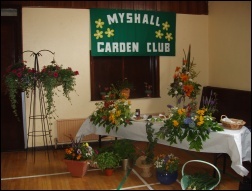 Myshall Garden Club has proved to be an invaluable asset to the community and an important part of our members' lives. We are delighted to have come so far, to have grown, to have shared and we are even more pleased when we look forward to future developments, where we hope to give as much pleasure as we will receive, being part of our marvelous evolving community.